The human eye is more similar to other mammal eyes than it is to the eyes of birds and fish. Yet, all vertebrate eyes share the same ground plan and differ in more fundamental ways from the eyes of invertebrates. Octopus, squid and spiders have eyes that superficially resemble those of vertebrates, but their internal structure, molecular signature, and the way they develop are so different that independent origins appear obvious. Insects typically have compound eyes where each facet lens represents one pixel in their vision. The enormous variation reflects a complex evolutionary history as well as very different visual needs in different animal species. I became interested in eye evolution early in my career when I studied the compound eyes of insect and crustacean and discovered several previously unknown principles of visual optics1,2,3. The enormous diversity in visual optics between different insect and crustacean groups surprised me, and I wanted to know how and why such diversity evolved. Years of work on these questions revealed functional routs by which the different types of compound eye could evolve into each other4,5,6,7. This led to more general questions of why animal eyes are so diverse, and I soon realised that nearly all morphological, functional and developmental information on eyes was concentrated to three animal groups12: vertebrates, arthropods (insects, crustaceans and spiders) and cephalopods (octopus, squid and cuttlefish). These animals belong to three animal phyla, which are the only ones where advanced eyes and high-resolution vision has evolved. The remaining animal phyla, about 30 of them, only have small and simple eyes without focused optics, or in many cases without any ability to form even the crudest image. Still, the core of all types of vision, the opsin proteins, clearly evolved only once in a common ancestor of all animals at least 800 million years ago. 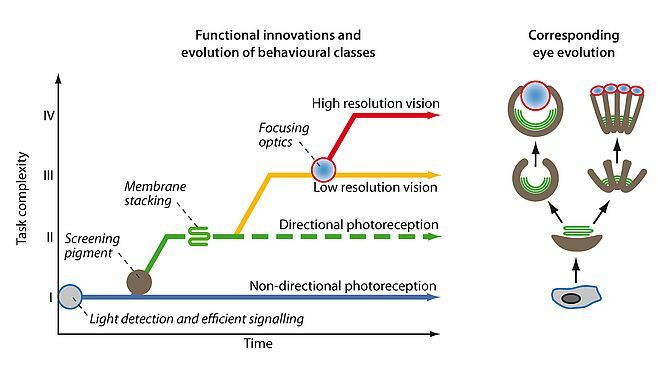 But from a photoreceptor cell expressing an opsin, there is a long evolutionary path to high-resolution vision. To understand the evolution of eyes and vision I thought it was necessary to learn more about all the intermediate stages between the non-directional photoreceptor cells and an advanced eye with high-resolution vision. To begin filling the gap of knowledge, I initiated a project to study vision in box jellyfish. Jellyfish are the simplest animals that have anything that can be described as an eye, and box jellyfish were known to have numerous eyes clustered on four sensory clubs suspended in little pockets on the inside of the bell. To our surprise we found that some of their tiny eyes had lenses with graded-index optics15. But the retina, formed by ciliated photoreceptors, was found to lie much in front of the focal plane of the lens. 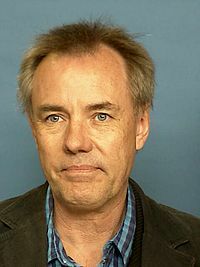 Their severely under-focused eyes are only capable of detecting objects subtending more than 10° in visual space15,16 (see Figure 1). Figure 1. (A) One of the four sensory clubs (rhopalia) of a box jellyfish, showing the two lens eyes. (B) A geometric model of the eyes with ray bundles revealing the focal point. Note that in the real eye, rays would be stopped by the dark pigment epithelium. (C) the author’s face as it would be sampled by the retinal mosaic in the larger lens eye (animal’s complete visual field of 170°). At first, such a low spatial resolution, about 600 times blurrier than human foveal vision, seemed to support the notion that eyes evolved from poor to perfect. But after many investigations of their visually guided behaviour we had to change our mind and accept that the acuity of box jellyfish eyes is perfectly matched to the needs of the few visually guided behaviours they are capable of. The species we studied (Tripedalia cystophora) live in mangrove swamps, and use vision to guide swimming towards bright areas where their plankton food is abundant. They also use vision to avoid swimming into mangrove roots16, and to detect the mangrove canopy above18 to avoid drifting out into open water where they would starve to death. These three visually guided behaviours all serve to position the animals in the best part of the habitat and this is ideally done with the coarse spatial resolution provided by their under-focused eyes. In fact, better acuity would have made them respond at the wrong distances or to the wrong stimuli, which effectively would have kept them away from the best places in the habitat. The conclusion here is that eyes did not evolve from poor to perfect, but from optimally controlling few and simple behaviours to optimally controlling numerous complex and demanding behaviours. It is the evolution of visually guided behaviours that has been the driving force in eye evolution. The evolution of gradually more complex behaviours has generated selection for improved visual performance. Following a simple principle of signal discrimination, I could group all behaviours that rely on photoreception into four major classes: I, non-directional photoreception, II, directional photoreception, III, low-resolution vision, and IV, high-resolution vision17,21. From this classification (see Figure 2) it is now possible to time the key innovations that paved the way for eye evolution, and also to work out if any of the steps occurred independently more than once. The result is that even if eye evolution was initiated only once by the first opsin protein, actual eyes have evolved independently several times17,21,23,24. Figure 2. Major steps in eye evolution from the first light sensitive neurons to the high-resolution eyes found in vertebrates, arthropods and cephalopods. The positions of key innovations are indicated in italics. The corresponding morphological evolution is shown to the right, and includes both single aperture eyes and compound eyes. My more recent work has involved opening a new field of study: “computational visual ecology”. By relating visual performance to its physical limits of diffraction and photon noise it was possible to calculate the maximum distance for performing specific visual tasks, and investigate how this depends on eye size and light intensity22. An interesting outcome of this project is that the largest eyes known, the 27 cm eye of giant squid, have become so large because of the unique task of spotting hungry sperm whales in the deep sea20. In an other project, which is on-going, we develop methods to simulate both spatial vision and colour vision in any animals eye. The aim is to find out how much and which types of visual information different animal eyes are able to pick up from their natural habitats. We use this strategy to understand tetrachromatic colour vision in birds, as well as the function of non-circular pupils in vertebrates and cephalopods. For both the project of computational visual ecology and the project for simulation of vision, it is crucial to be able to calculate the number of photons per second that are detected by each photoreceptor cell in the retina. It was disappointing to find that natural light was measured mainly as illuminance (the amount of light falling on the environment from above) using simple lux-meters. From this it is impossible to calculate the photon flux that is detected by different photoreceptors in an eye. To solve the problem we developed a new method to measure the amount of light reaching an eye from the environment. It uses a digital camera to determine the statistics of photon radiance as a function of elevation angle with the same spectral resolution as human and animal vision. During several years we have applied the new method to hundreds of different environments from around the world, from dense rainforests to empty deserts, at all times of day, at different seasons and during different weather conditions. For the first time we will be able to say how bright the world actually is. We are now in the process of writing up a description of the new method and all our data about the light distribution on planet earth. 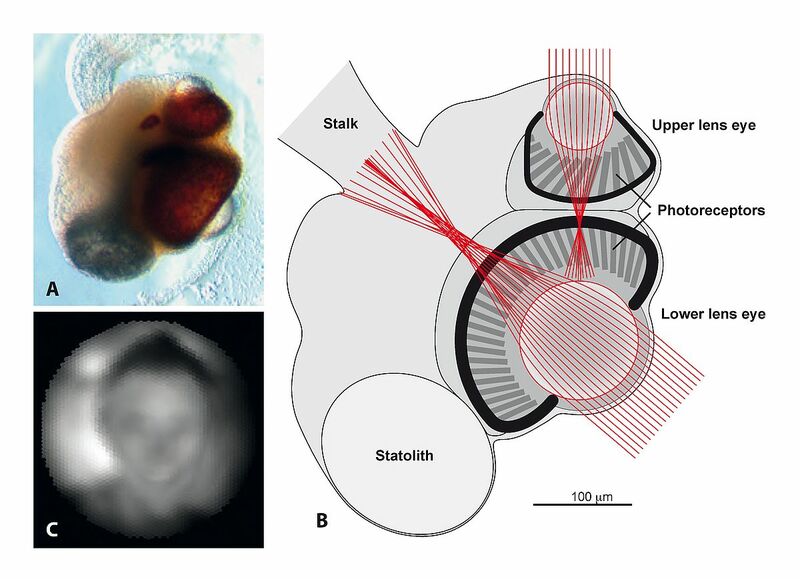 Bok MJ, Porter ML, Nilsson D-E (2017) Phototransduction in Fan Worm Radiolar Eyes. Curr Biol, 27, R681–R701.